Epicorsia oedipodalis (Guenée) is known as the fiddlewood leafroller and the seagrape moth. These caterpillars roll up leaves of the host plants and use the rolled leaves as larval retreats and locations for pupal cocoons. This caterpillar can completely defoliate fiddlewood, a Florida native that can form a large shrub or small tree. This leaf-eating pest does no permanent damage to the plant, the shrub simply puts out a new flush of leaves. From an ecological perspective, the larvae themselves may serve as a valuable food source when baby birds need feeding during the spring dry season in Florida. Botys oedipodalis Guenée, 1854 p. 336; in Boisduval & Guenée, from the type locality in Haiti. Botys butyrosa Butler, 1878; Proc. Zool. Soc. London 1878: 493, described from Jamaica. Epicorsia Hübner, 1818; Epicorsia mellinalis Hübner, 1818. Note: Some taxonomists place Pyraustinae and Epicorsia in the Family Crambidae. Southern Florida; Cuba; Cayman Islands; Jamaica; Hispaniola; Bahamas and Turks. 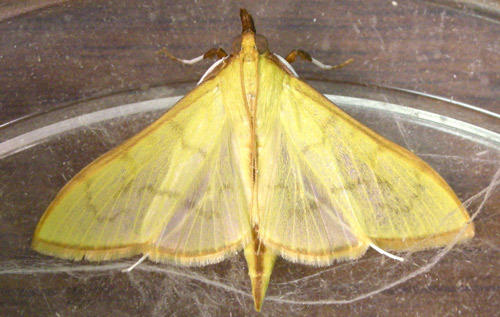 Adult: The adult moth is 18-20 mm long with a 34-40 mm wingspan. The moths are much less conspicuous than the larvae. The adults seen in Figures 1 and 2 were reared from field collected cocoons. Figure 1. Adult Epicorsia oedipodalis (Guenée), dorsal view. Photograph by W.H. Kern, Jr., UF/IFAS/FLREC. Figure 2. 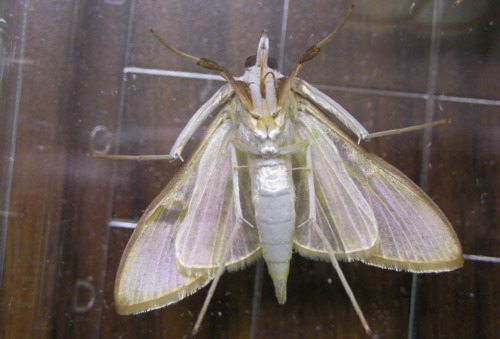 Adult Epicorsia oedipodalis (Guenée), ventral view. Photograph by W.H. Kern, Jr., UF/IFAS/FLREC. 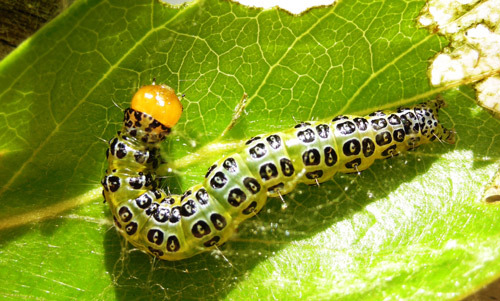 Larvae: The larvae are green with a yellow-orange head capsule. Each abdominal segment has four dorsal black eye-spots and one lateral eye-spot on each side. 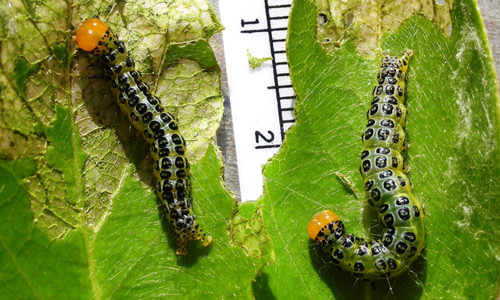 Younger larvae skeletonize the leaves while late instar larvae browse the leaf margins (Figures 3-4). 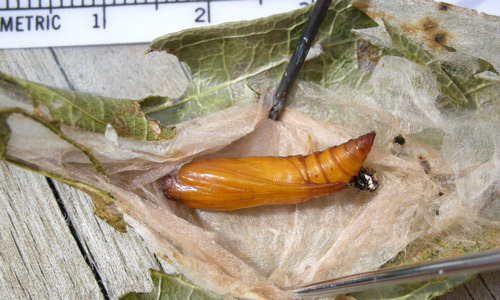 During the day the larvae hide in their tied-leaf retreats (Figure 6). Figure 3. Epicorsia oedipodalis (Guenée) caterpillar on fiddlewood. Photograph by W.H. Kern, Jr., UF/IFAS/FLREC. Figure 4. 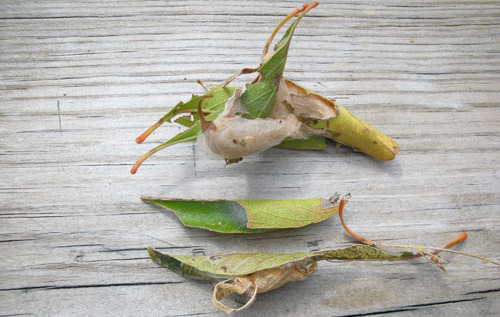 Larvae of Epicorsia oedipodalis (Guenée) on fiddlewood showing both skeletonizing and leaf margin damage. Photograph by W.H. Kern, Jr., UF/IFAS/FLREC. Pupae: The pupae of Epicorsia oedipodalis are found inside silk cocoons within the rolled leaves of the host plants. Figure 5. Epicorsia oedipodalis (Guenée) pupa inside rolled leaf cocoon. Photograph by W.H. Kern, Jr., UF/IFAS/FLREC. Figure 6. Epicorsia oedipodalis (Guenée) rolled leaf cocoons and daytime retreat for larvae. Photograph by W.H. Kern, Jr., UF/IFAS/FLREC. The larvae of this moth feed on the foliage of fiddlewood, Citharexylum (Verbenaceae); seagrapes and pigeon plums, Coccoloba (Polygonaceae); and lancewood, Ocotea coriacea (syn. Nectandra coriacea) (Lauraceae). Fiddlewood (Citharexylum spinosum / syn; C. fruticosum) is an evergreen shrub or small tree that grows in southern Florida and the northern Caribbean. As a native landscape plant it has many fine qualities: evergreen leaves, nectar for pollinators, fragrant flowers, and berries that are attractive to wildlife. In Florida, we can also expect to find the larvae on seagrape (Coccoloba uvifera), pigeon plum (Coccoloba diversifolia), and lancewood (Ocotea coriacea), though less damage has been noted on these hosts. Figure 7. 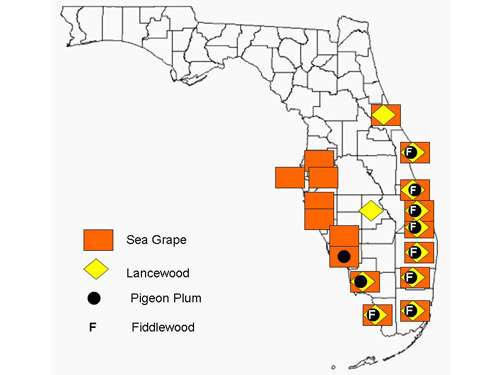 The hypothetical range of Epicorsia oedipodalis (Guenée) based on the natural ranges of its four main hosts: seagrape (Coccoloba uvifera), pigeon plum (Coccoloba diversifolia), lancewood (Ocotea coriacea), and Florida fiddlewood (Citharexylumspinosum). Map created by W.H. Kern, Jr., UF/IFAS/FLREC. Original range maps from Atlas of Florida Vascular Plants. The habitats for the host plants of Epicorsia oedipodalis are the tropical hardwood hammocks and coastal hammocks of southern Florida, the Florida Keys, and the West Indies. Citharexylum spinosum occurs in southern Florida (Brevard, Indian River, St. Lucie, Martin, Palm Beach, Broward, Dade, and Monroe counties), Cuba, Cayman Islands, Jamaica, Hispaniola, Bahamas, Turks, Puerto Rico and the Virgin Islands. Gardeners have expanded the range of fiddlewood up the west coast of southern Florida as far north as Pinellas County. It has also been introduced to Hawaii. The four native host plants have become increasingly important as landscape plants in coastal regions of southern Florida. The defoliating action of Epicorsia oedipodalis caterpillars can have a temporary effect on the marketability of nursery stock. Other than that, they only cause moderate aesthetic damage. 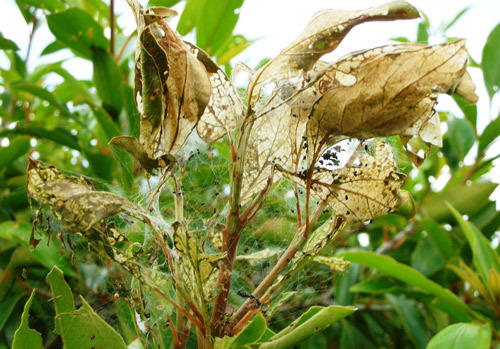 In southern Florida, Epicorsia oedipodalis defoliates Florida fiddlewood and causes ephemeral aesthetic damage. The plants do recover and put out a new flush of leaves, but during the event, the damage is unacceptable to most homeowners. Figure 8. Characteristic damage from Epicorsia oedipodalis (Guenée) larvae on fiddlewood, (Citharexylumspinosum). Note the skeletonized leaves and the leaves webbed together. Photograph by W.H. Kern, Jr., UF/IFAS/FLREC. Figure 9. 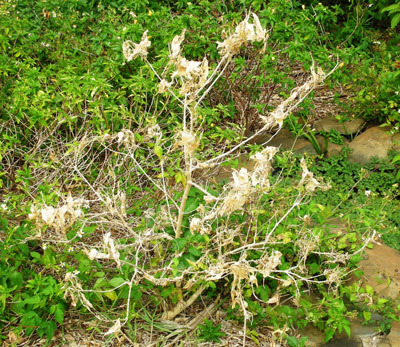 Complete defoliation of a fiddlewood, (Citharexylumspinosum) by Epicorsia oedipodalis (Guenée) larvae. Photograph by W.H. Kern, Jr., UF/IFAS/FLREC. Chemical Control: The caterpillars are best controlled with Bacillus thuringiensis kurstaki (B.t.k. ), which is available in a number of products. Apply according to label directions. This Lepidoptera-specific material is toxic to caterpillars but relatively non-toxic to beneficial organisms like predatory and parasitoid wasps, predaceous bugs, and vertebrates (birds, lizards, people, etc.). Parasites. None reported or identified as of 2014. Predators. Paper wasps (Polistes and Mischocyttarus) were observed hunting for caterpillars on infested fiddlewoods. Predatory stink bugs (Alcaeorrhynchus) were observed feeding on caterpillars several times. The milkweed assassin bug (Zelus longipes) was also abundant on infested fiddlewoods, as well as many other plants besides milkweed (Asclepius spp.). Butler AG. 1878. On a small collection of Lepidoptera from Jamaica. Proceedings of the Zoological Society of London 1878: 480-495. Boisduval JBAD, Guenée A. 1854. Huitiéme. Deltoides et Pyralites. Histoire Naturelle des Insectes. Species Général des Lépidoptéres. 8: 336. Gilman E F. 1999. Citharexylum fruticosum. University of Florida. Horticulture Database. (3 February 2015). Hodges RW. (ed.). 1983. Checklist of the Lepidoptera of America North of Mexico. Wedge Entomological Research Foundation. London. pp. 284. Hübner J.1818. Zuträge zur Sammlung exotischer Schmettlinge. Vol. 1 [1808-] 1818 1: [1-3], 4-6, , 8-32, [33-40] (post 22nd December 1818), pl. [1-2], f. 1-12 (1808 - 1809), pl. [3-25], f. 13-146 (1809 - 1813), pl. [26-35], f. 147-200 (1814 - 1818). Munroe E. 1976. Pyraloidea. Pyralidae (part), fascicle 13.2 A-B. Pp 1-150. In Dominick RB. (et al. eds.) The Moths of America North of Mexico. EW Classey, Ltd. and The Wedge Entomological Research Foundation. London. USDA/ NRCS Plant profiles. 2015. Nectandra coriacea (Sw.) Griseb. Lancewood. (3 February 2015). Author: William H. Kern, Jr., Entomology and Nematology Department. Photographs: William H. Kern, Jr., Entomology and Nematology Department. Publication Date: February 2015. Reviewed February 2018.